Predation by feral cats is one of the greatest threats facing threatened species and fauna assemblages across Australia. The ongoing management of the impacts of feral cats is a challenging task and although there are many techniques being trialled, we don’t seem to have found a ‘silver bullet’ for successful control. Across Australia trapping, using both leg-hold and cage traps, shooting, dogging, poison baiting and disease are the most widely used and successful techniques for the eradication of cats in predator-proof fenced sanctuaries. Cage trapping, although not cost effective over large areas, can be effective in small or isolated areas, or for high density populations, particularly in urban or peri-urban areas (e.g. rubbish tips). We have previously posted about field trials of the ‘Curiosity’, ‘Eradicat’ and ‘Hisstory’ baits in Western Australia, and looked at the success of the predator exclusion fencing programs that Australian Wildlife Conservancy have undertaken at various locations around Australia. New approaches and alternative approaches are being examined and assessed (e.g. ‘Felixer’), which is currently being trialled across Australia. grooming traps or ‘Felixer’ traps. Dr Jeff Short and colleagues (1997) tested a novel 1080 bait application method at two sites at Heirisson Prong in June 1995. Prior to 1995, trapping was the most successful method (spotlight shooting, poisoning and trapping were tested) to control cats, accounting for 78% of 210 cats removed (Short et al 1997). However, trapping is relatively labour intensive and has limited application at a landscape scale because of the cost and wariness of cats to traps. Successful alternative management strategies were therefore required. As an alternative to trapping, Short et al, (1997) examined whether poisoned mice could be used as a reliable bait for cat control. One 1080 poison oat (4.5mg of 1080 poison) was placed in the mouth of each frozen laboratory mouse carcass. Mice were chosen as they are a dominant food source for cats in the region, they area a suitable bait size and medium and were readily available from a commercial supplier. The poison mice were laid at 100m intervals along transects and activity around baits was monitored using sandpads. Roads are easy to access for laying baits and they have shown to have a higher visitation rate than in the bush (Read et al 2015). Baits were laid late afternoon and early evening to reduce the chances of corvids eating the baits (Doherty and Algar, 2015). On the first three days, baits were collected in the morning, frozen, and then put out again late that afternoon. Baits were not retrieved at the end of the trial. Spotlight surveys were also conducted prior to and after the baiting trials. In addition to these observations, five radio-collared cats were present in the area and had been previously monitored for 7-13 months. Fifty-eight percent (58%) of all baits removed during the trial were by cats, and the remainder by little crows (Corvus bennetti) and baits were still being removed on the last night of baiting. Spotlight counts of cats declined by 74% between pre- and post-baiting surveys (100% at one site and 64% at the other) and all cats with radio-collars died. Fresh carcasses of three cats and a fox were also found when recovering radio-collared cat carcasses. Short et al. (1997) attribute the success of the program to the choice of bait medium and timing of the bait application during a period of food shortage. Mice are a familiar food item for cats in the local area (Risbey, 1996), the mouse carcasses were an ideal size for cats (~15 g compared with 40-g meat baits used for foxes), and they were fresh (stored frozen) rather than dried, so they were likely to be more palatable to cats. Typically, some of the translocated or reintroduced populations (or sub-populations) of threatened fauna are radio-collared to monitor the success and movement of individuals. Emerging evidence suggests that once a cat predates upon a new or challenging species (i.e. translocated threatened species) which it has not been exposed to before, the individual feral cat would systematically attempt to eradicate all of the available individuals of this species (Moseby et al., 2015; Read et al., 2015; Hardman et al., 2016). Read et al. (2015) have used evidence from some of the radio-collared individuals which were predated upon during these reintroductions to propose a novel approach to cat control. Read et al. (2015) proposed that the reintroduced animals could become active ‘Trojans’ by killing or discouraging predation, by wearing modified collars or harnesses containing a dose of lethal poison. Previous studies indicate that cats will primarily predate on the back of the telemetry collar, so by attaching a blister pack or strip of liquid poison (i.e. PAPP or 1080) any predator would ingest the poison when it attacked and killed the Trojan individual. Although the Trojan would most likely be killed in the process, the cat would also die which could be considered an acceptable sacrifice given the protection of the remainder of the translocated population. Read et al. (2015) have considered combining the well-known use of implantable microchips and recently available encapsulated baits as an alternative to a toxic collar or harness. Fauna could be subcutaneously inserted with an inert, micro-chip sized dose of poison that is lethal to cats and foxes. Development of the toxic implant would utilise the pH differential between the implant site (pH~7.4) and stomach of a cat (pH~1.5-3.7) to ensure that a stable inert implant was present in the Trojan species but rapidly absorbed by a cat once swallowed. As cats typically eat the entire small prey (i.e. rodent, dunnart <20g) the placement of the poison capsule is not critical, however, if the implants were use in larger Trojans, the placement should focus on areas targeted by the predator species (i.e. back of the neck or shoulders). Although innovative and potentially effective in certain circumstances, the application of toxic harnesses and implants in broadscale management of cats and foxes will be limited by the small number of animals that could be used. A more applicable regional scale application is therefore required. Read et al. (2015) went on to discuss the potential of rendering the gut, tissues and possibly bones of live prey items toxic to cats, through ingestion of sub-lethal doses of food containing compounds toxic to cats. Gastrolobium plants commonly found in the south-west of Australia contain high concentrations of fluoroacetate (i.e. 1080), the poison that is used widely in Australia for vertebrate pest control because of the beneficial disparity in tolerance between many native and introduced species (Twigg and King 1991). Trojans could therefore potentially be fed an artificial food source that is laced with 1080 which overtime would build up in their system. Supplementary feeding is not a new strategy and is used in situations to increase the survival chances of fauna that are reintroduced into a new environment (i.e. translocations), in areas where survival is limited by nutritional availability and where there are increased predation risks in exposed locations. The supplementary feeding would render the threatened or reintroduced species toxic to feral cats without impacting on its own health. If supplementary feeding is problematic, it may be possible to augment the ecosystems to promote the growth of plants containing Gastrolobium which are then in-turn eaten by insects and predator species get a build up of the poison via consumption of the insects. Whatever delivery mechanic is chosen, the specific choice of a trojan species and the poison would be selected on a case-by-case basis, and would depend on a variety of factors including risk of secondary poisoning, safety to non-target species, long last poison and encapsulating device. In the south-west of WA, 1080 is the obvious choice due to its well-researched risks to non-target species and persistence in the native vegetation. Other chemicals lethal to cats would also be suitable and may include the recently tested para-aminopropiophenone (PAPP). Although not legal in Australia and a higher risk to non-target species, the use of cyanide would be effective and provide a clear indication of whether the concept would work as the carcass would be found in close proximity to the collar or ingested capsule (Read et al 2015). The choice of toxic trojan species is a difficult one and would vary depending on locality. The species would need to be a widespread species, relatively abundant, tolerant to the poison, but also a preferred prey item for cats (Read et al 2015). A preference should be for species that is not threatened, is a similar size to native prey items, and is abundant but also still appeals to the hunting instincts of cats. Dr John Read has utilised a cat’s innate need to self-groom into a lethal control technique. The grooming trap or ‘Felixer’ is currently in the final stages of product development and is being trialled in a few localities across Australia (Guardian and Business Times). The Felixer is able to detect the presence of a cat through use of video analysis and laser tripwire sensors. The laser sensors need to be triggered in a specific way before the device is armed which ensures that non-target fauna (i.e. dogs, western quolls, wallabies, etc) are not sprayed with the poison. Once a cat is identified by the Felixer, it then sprays a lethal dose of toxic gel onto the cat’s fur from up to 4m away as it is walking past. The cat then instinctively grooms the gel and in doing so ingests the poison and dies (Read et al. 2014). The traps are solar powered, automatic once set up, reset after each dose and have sufficient capacity for applying 20 doses of poison to cats. The various sensors are designed so that only cats are targeted and all interactions are recorded for analysis. Rowena Hamer is a PhD student is investigating the potential for the Felixer traps to be used in areas where both feral cats and Spotted-tailed Quolls (Dasyurus maculatus) are present. Spotted-tail quolls are a similar size to a cat and this study will be used to refine the Felixer sensors to be used at more locations around Australia. 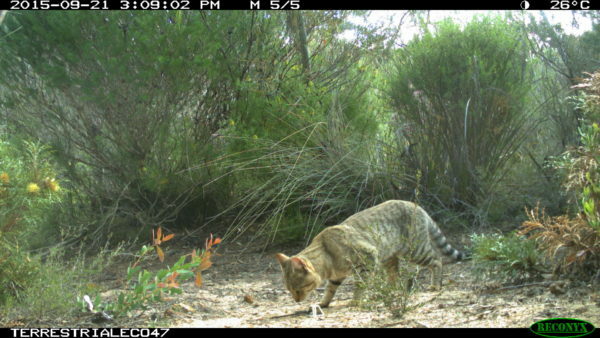 She is currently attempting to crowdfund the costs of this research so please have a look at her project, as research like this is critical to the ongoing fight against feral cats. The management of cats at a landscape scale is difficult. Trapping and shooting are not effective at a landscape scale and cats are only likely to take a bait, approach a lure or eat an alternative food source during a period of food shortage. Timing, if baits are used, is therefore critical and restricts when baits can effectively be used. This gives increased importance to developing novel techniques. Other programs including top-predator conservation and release, maintaining and restoring habitat complexity and ecological refuges, exclusion fences and assisted behavioural and evolutionary ecology may be viable alternatives (Doherty and Ritchie 2016). The only way we can ever hope to control feral cats at a landscape scale is through an integrated, humane control and management program. We would therefore encourage researchers and land managers to ‘think outside the box’ when it comes to feral and pest animal management programs and consider alternative approaches, discuss them with colleagues and seek expert advice on the topic. Moseby K. E., Peacock D. E. and Read J. L. (2015) Catastrophic cat predation: A call for predator profiling in wildlife protection programs. Biological Conservation 191, 331–340. Risbey, D. A. (1996) The impact of feral cats. Final report (Part 1) to Shark Bay Salt Joint Venture, Perth, WA. 66 pp. Read, J.L., Bengsen, A.J., Meek, P.D., and Moseby. K.E. (2015) How to snap your cat: optimum lures and their placement for attracting mammalian predators in arid Australia. Wildlife Research 42, 1-12. Posted in Latest News, Pests and tagged feral animal control, feral cats, pest control, pests.